“Stay in touch” is a popular phrase in American business conversation. But when it comes to having a solid understanding of the challenges and complexities of our various government, private and nonprofit sectors, many of us aren’t as in touch as we’d like to be. 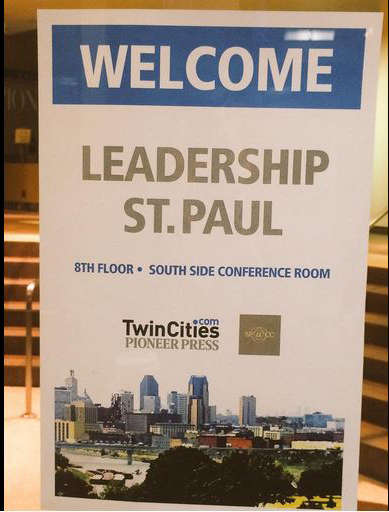 Leadership Saint Paul is helping close the loop on that understanding gap. The flagship adult learning program of the Saint Paul Area Chamber of Commerce (SPACC), Leadership Saint Paul (LSP) prepares, challenges and engages emerging and existing leaders. Each year the Chamber selects more than 50 local leaders from the private, public and nonprofit sectors to participate in the 10-month program, providing insider access to top-level business, civic and government leaders to facilitate productive conversations around critical issues that influence the Saint Paul and East Metro region. That commitment has paid off. About 1,800 people are alumni of the program, which is now in its 36th year. “It was a great experience,” says John Haydon, vice president, marketing and business development for Kraus-Anderson Construction Company and an LSP alumnus. “It built long-lasting relationships with other leaders in our community who care about the quality of the east metro,” he said. KA graduates of the 2015 program Dustin Phillips, LEED Green Associate, project manager in the Circle Pines office; and Cortney Bailey, proposal coordinator in the Minneapolis office; who offered their reflections on the experience. Q: How did you first hear about LSP? PHILLIPS: I was looking for ways to get involved around the community where I lived. John Haydon and I spent time discussing options and he personally recommended LSP as a great way to learn about Saint Paul and the different dynamics that make it the place it is. BAILEY: I had asked my boss, John Haydon about opportunities for professional development and he suggested I look into Leadership Saint Paul. After some research online and social media perusing I wanted to be part of the 2015 class and learn more about the inner workings of the City, challenge my perspectives, meet extraordinary people, and give back to the community. It’s access to an experience you would never otherwise get to have. PHILLIPS: The application process was very straightforward. I provided my general information as well as explained what I hoped to get out of the LSP program and what it would mean to me personally/professionally. Then I had an interview with Elisa just walking through my application and how the program would be a good fit. BAILEY: There was an application and time commitment waiver we had to sign and send in. The best part was sitting down face to face for the acceptance interview with the director for the Saint Paul Area Chamber of Commerce, talking about our goals for the class and also about what we hoped to achieve with our employer. Q: Talk about the curriculum and activities in LSP. What do participants do? BAILEY: Each year the Saint Paul Chamber of Commerce Foundation selects a new curriculum chair and leaders for each of the 10 day long sessions we have. These teams worked to create a snapshot of the various sectors operating in Saint Paul, so we had a front row seat to what takes place and the players in those sectors, all while keeping in mind the stakeholders impacted on each level. Our focus topics were Government, Media and Communications, Education, Economic Development, Arts and Culture, Human Services, Healthcare, Criminal Justice, Year End Wrap Up, and graduation. Each day we would first network within our class while we had our coffee and prepped for the day. The portion I always looked forward to was with Damon Shoholm, senior leadership manager at the Amherst H. Wilder Foundation. He would always challenge us to think very critically about the information we were going to digest and prepare us by bringing up the various lenses in which the decisions are made, the people making those decisions, and the impact those decisions have. From there, we typically had an opportunity to hear from some of the players within that sector and ask questions to create a dialogue. Depending on the day we would also have an opportunity to tour a facility or section of town pertaining to our topic (Government Day – Secretary of State Building; Criminal Justice Day – Saint Paul Police Department/Jail; Human Services Day – Dorothy Day Center; Media and Communications Day – KSTP/Twin Cities Live studio audience experience). At the end of the sessions we would unpack what we learned together. Then the “afterglow” was an opportunity to get to know our class more on a personal level. In addition to the monthly sessions, we also worked in subgroups, meeting once or twice a month on a selected service project assignment. Q: What was the most challenging aspect of the program for you? BAILEY: We were committed to attending every second Thursday of each month for an entire work day. KA fully supported the full LSP experience and I have a great team in marketing that enabled me to be out those days without having to be concerned about deadlines that day. The time spent working on our service project was typically in the evenings. PHILLIPS: Information overload on each meeting day. A lot of us knew very little about the local government, the education system, the arts or healthcare. These were very active days with little reflective time to digest what was thrown our way. In a way it was great, but some information wasn’t retained due to this. Q: What stands out for you in terms of the experience and what you learned? PHILLIPS: It was eye opening to see the behind-the-scenes struggles that school districts face. This includes teacher-to-student ratios and funding efforts when compared to charter schools, to name a few. The overall theme is that, as time goes on, everyone is having to do more with less. Each sector is having their own struggles with this and we were given insight as to how they plan to tackle these problems in the upcoming years. BAILEY: As cliché as this may sound the biggest thing I took away from this program is that the terms “leader” and “leadership” are construed to be this individual who has so much influence and power. The idea of a leader is put so far up on a pedestal that it actually can inhibit those who have great ideas or ways to impact positive change; they refrain for fear that they cannot live up to being a leader. This program was a great reflection of leadership, including the entirety of a team. There is an opportunity for leadership in almost every situation of every day; and to me, if you can have even an ounce of positive impact that is true leadership. Q: Would you recommend this program to others? Why or why not? PHILLIPS: I would recommend this to anyone wanting to know more about Saint Paul. With a flood of information offered, you are bound to absorb something. The connections I’ve made with LSP will continue long after this program. The world is smaller than we think and I’ve already run into classmates within our construction industry. BAILEY: YES! I would say if you have a great employer who will support you in being part of LSP, then without a question you need to do it. You may have different takeaways than I did, but you will gain so much from meeting the people you meet and the experiences you have in this program. Q: Did KA help facilitate your LSP experience? BAILEY: KA supported my pursuit of the program and assisted with application fees and the time during the work day away. PHILLIPS: KA provided the sponsorship to join LSP along with standing behind the monthly time commitment required to participated in the program. Kraus-Anderson leadership, for me, has always stood behind growing their employees. Not only for the company, but for the individual. If the employee truly wants to learn and has a goal, Kraus-Anderson has stepped up and done everything they could to help achieve it. That is what a people-focused company is all about.